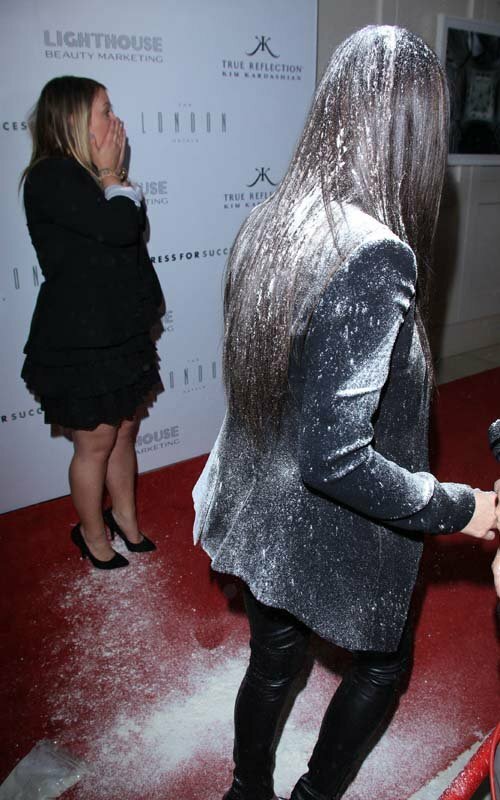 Man… you write one “I Hate Kim Kardashian” blog (or dozens) that gets national media coverage where you are accused of threatening to kill Kim… and next thing you know, you’re getting blamed for Kimmy K getting flour-bombed on the red carpet. Listen up, and listen closely… I’m talking to you, LA Sheriff’s Department, I did not hire anybody to antique Kim Kardashian. I do not know the nice young lady that performed this cruel act. Flour bombage! Cracks. Me. Up. Gotta give props to Kim though… she handled it as well as one could, I think. The part about this that will fly under the radar… are the comments by the rest of the family. Has there ever been a more narcissistic group of people on the planet? Oh, my sister got flour thrown on her? Bummer… let’s bring this back to ME though. Kris Jenner told E!, “If anybody comes at me with something, call security.” Khloè Kahttp://lobshots.com/wp-admin/post.php?post=8816&action=editrdashian Odom tweeted, “I wish I was with my sister tonight. I bet you that woman wouldn’t have dared tried a thing...” Kourtney Kardashian also tweeted, “Classy to flour bomb my sister at her charity event helping women. I wonder if they would have dared thrown the flour at my hormonal and pregnant self!” I, I, I… me, me, me! They all make me sick. Oh, and to you, flour bombing mystery girl… hit your boy BP up… I owe you a dinner. This entry was posted in Celebrities, News and tagged I Hate Kim Kardashian, Kim Kardashian, Kim Kardashian antiqued, Kim Kardashian flour bombed. Bookmark the permalink.